The chemical elements are the building blocks of life. We utilise various chemicals and chemical reactions every day, mostly without any conscious thought of the processes involved. For those who do like to have some idea of the how it all works, 30-Second Elements offers an overview of 50 of the most useful and interesting elements of the Periodic Table, offering readers an understandable and fascinating introduction (or refresher course) into the chemistry of our everyday lives. Elements range from the familiar (sodium, calcium, iron, copper, gold, oxygen) to some elements that I definitely don’t recall from my high school science lessons (technetium, hafnium, ununseptium, flerovium). Each entry includes a 30-second summary, a list of related elements, names and dates for scientists involved with the history of the element in some way, and a 3-second summary containing the chemical symbol, atomic number and the source of the element name. Each element is accompanied by a full-page colour image. The book is divided into chapters corresponding to the different sections of The Periodic Table (Alkali & Alkaline Earths, Metalloids, etc) with each section including a glossary of common terms. There are also brief biographies of significant scientists throughout the book, including Marie Curie, Paul-Émile Lecoq de Boisbaudran and Dmitri Medeleev. Edited by Eric Scerri, a lecturer in Chemistry and History & Philosophy of Science at UCLA and founder and editor of the Foundations of Chemistry journal, the information on the various elements is sourced from a team of contributors with extensive knowledge of chemistry including academic chemists, university lecturers, and scientific writers. 30-Second Elements is a fantastic introduction to the science of chemistry for children and adults interesting in knowing more about the elements of the Periodic Table and the role they play in our everyday lives. The information provided is interesting, relevant and communicated in a way that is easily understood, even by those with only a rudimentary understanding of science. It is a great book to flick through, as I did, to uncover interesting facts. There is a resources section at the end of the book with a list of books, magazines/journals, and websites for those who want to know more. 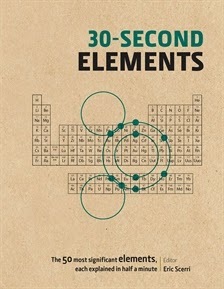 If you have a future science boffin in your home, 30-Second Elements is the perfect gift to introduce them to the foundations of chemistry. This book is part of a series by Murdoch Books that includes 30-Second guides to a variety of subjects including Maths, Psychology, Religion, Economics, Philosophy, Politics, Astronomy and Mythology.